David W. Ginavan, Age 84, born on September 9,1930 in Goodman Missouri and a resident of Claremont, CA. passed away peacefully at his home with his loving family by his side. Dave was preceded in death by his parents, Jesse and Zena Ginavan, Siblings; Joe, Carol, Vera, Dan and Nephew Terry Wilshusen. Dave is survived by his loving wife of fifty-five years, Nancy; beloved daughters; Julie (Tim) Fairbanks, Lynn (Jim) Weeks, and Dana (Mike) Leyland, his grandchildren; Michael and Kimberlyn Weeks. He also leaves behind a niece and two nephews, as well as many dear friends. Dave graduated from Paso Robles High School, Class of 1949, he still enjoyed connecting with his former classmates at their reunions. In 1950, Dave joined the United States Air Force with his brother Dan. It was in the Air Force that Dave acquired his skills and training as a Radar Technician. This lead to his employment at Bendix Field Engineering Corporation, in 1954. He enjoyed a 40+ year career at BFEC, traveling and living in many locations in and out of the United States. It was on one such trip to Pensacola, Florida that he met the love of his life, his wife Nancy. After a short 3 month courtship, they were married in November 1959. The following September, while Dave was in Bermuda, their first of three daughters was born. Dave and Nancy enjoyed their years of travel to and work in such places as; Bermuda, Nigeria, Guaymas, Merritt Island (Vanguard), Barstow (Goldstone), Spain, Australia and New Zealand. Dave retired from a successful career at BFEC in 1994 as the Director of Pasadena Operations; following the birth of his first grandchild. Former co-workers would comment that Dave was extremely fair and the most honest person they had ever known or had the pleasure of working with. But the job he enjoyed most was that of husband, father and grandfather. During his retirement, he returned to his love of woodworking in his garage. He developed a passion for photography and documented every occasion, sharing his photographs with family and friends. He was extremely proud of each daughter and never hesitated to share that. Being grandpa to Mike and Kimmy was his last and most rewarding job. Dave lived a wonderful, blessed life and he will be missed dearly. 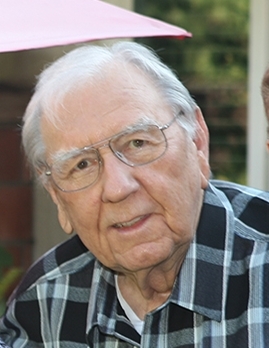 A memorial celebration of his life will take place at the family home at 3376 N. Mills Avenue, Claremont, California on Saturday August 15, 2015 from 4pm-7pm. Cremation has already taken place. His ashes will be scattered at a place that is very special to Dave and Nancy, at a later date.